On September 7, the Miami-Dade Commission approved Fiscal Year 2015-2016 end-of-year budget by a vote of 13-0 with an amendment that directs the Mayor to appropriate 50 percent of carry-over funds in excess of the adopted budget up to $10 million to the Affordable Housing Trust Fund. In May 2016, the Commission unanimously passed an ordinance establishing within the Affordable Housing Trust Fund as a revolving loan fund intended to make short-term loans for construction, rehabilitation, or acquisition of land or housing for sale or rental. The Revolving Loan Fund will be administered by an outside administrator selected through a competitive Request for Proposals process. The Board of Trustees of the Trust Fund shall serve as the selection committee for review of the Requests for Proposals and shall make a recommendation to the Board of County Commissioners for the selection of an outside administrator. The Board of County Commissioners shall make the final choice of outside administrator. The administrator chosen must be able to demonstrate the ability to leverage the funds in the Revolving Loan Fund, must demonstrate a proven track record of administering similar programs and must demonstrate an ability to combine the Revolving Loan funds with its existing affordable housing resources. The $10 million allocation will seed the loan fund, along with addition sources of income, which through payback of loans and interest, will provide ongoing resources for the development of affordable housing. The drive to allocate $10 million to the Affordable Housing Trust Fund was a combination of strong leadership on the Commission, and unwavering advocacy from People Acting for Community Together (PACT), South Florida Community Development Coalition, and Miami Homes for All. PACT, a member of the DART network, unites, organizes and trains leaders from diverse congregations, schools and community groups to build a powerful community voice in order to hold officials accountable, achieve systemic change, and promote fairness, justice and democracy in Miami-Dade County since 1988. South Florida Community Development Coalition (SFCDC) is a nonprofit membership organization dedicated to building communities and developing assets in Miami-Dade County through expanding the capacity of community development practitioners to develop affordable housing and economic opportunities. Miami Homes For All, Inc, formerly the Miami Coalition for the Homeless, was founded in 1987 to promote community efforts preventing and ending homelessness in South Florida by establishing alliances with agencies and organizations. Faced with significant shortage of affordable rental and ownership housing in Dade County that was particularly damaging to families and individuals at or below 50 percent Area Median Income, two years ago PACT leaders launched a campaign to amend and fund the County’s existing Affordable Housing Trust Fund. Established by the Miami-Dade Commission in 2007 with the purpose of increasing and improving the supply of affordable housing, the Affordable Housing Trust Fund was set up to fund the acquisition of property and property rights, cost of construction including costs associated with planning, administration, design, building or installation, as well as any other costs associated with the construction or financing of housing affordable. However, with a total allocation of just $1 million and without a board or sufficient guidelines to ensure that households at the lowest income levels would benefit from the resources, the fund was equipped to address the county’s most pressing needs. At PACT’s annual Nehemiah Assembly in April 2015, PACT leaders secured public commitments of three members of the Dade County Commission to improve and make operational the Affordable Housing Trust Fund by (1) appointing a high level staff person to run the trust fund, (2) amending the trust fund so that half the funds serve people at or below 50% AMI with at least 20% of the funds serving people at or below 30% AMI; and (3) to meet with PACT by October 2015 to report progress. Two of the Commissioners, Barbara Jordan and Dennis Moss, pledged further help to identify a dedicated revenue source that would produce at least $10 million annually by 2017. In October 2015, PACT celebrated a victory, as the Dade County Commission amended the language Affordable Housing Trust Fund, establishing a set-asides directing of 30 percent of the monies to serve very low income households and 20 percent to serve extremely low income households. The Commission designated Clarence Brown from Department of Public Housing and Community Development to run the Housing Trust Fund. 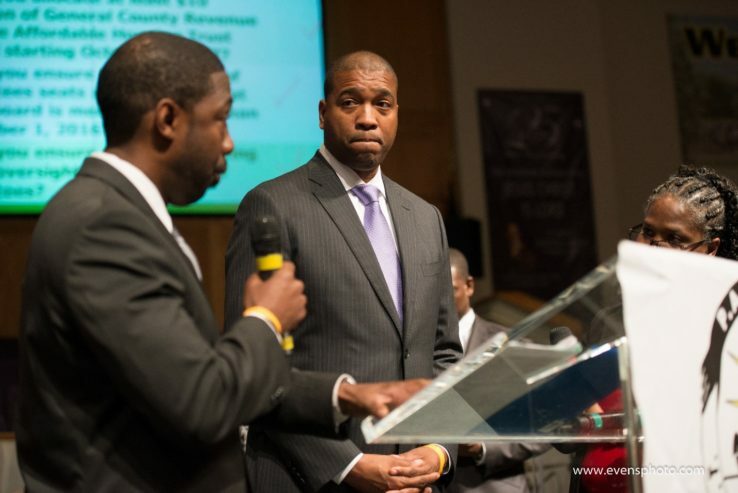 Momentum continued to build in April 2016, as PACT welcomed Miami-Dade County Deputy Mayor Russell Benford to its Nehemiah Assembly and secured from him a pledge to identify new funding sources for the Trust. In May 2016, the County Commission voted to either allocate 10 percent of any projected increase in general fund revenues or $10 million, whichever amount is lower, to the Affordable Housing Trust Fund. As the Commission began deliberations about end-of-year budget amendment for Fiscal Year 2015-2016, PACT and Miami Homes for All turned up the heat, publishing an Op-Ed in the Miami-Herald on September 7 co-signed by ten additional organizations calling for the Commission to maintain their pledge of $10 million for the Affordable Housing Trust Fund: Because the commission’s [May 2016] resolution is subject to annual appropriations, this new funding is at severe risk of not being allocated. It is a difficult task to balance complex and multi-faceted priorities. However, housing must be a top priority as it is the bedrock upon which healthy, vibrant and resilient communities are built. The Commission kept its promise, with Commissioners Jordan, Daniella Levine-Cava, Audrey Edmonson, and Chairman Jean Monestime co-sponsoring the ordinance creating the revolving loan fund and showing unanimous support the loan fund and $10 million allocation.